The term “smart” in technology is something that we have gotten used to in the past 10 years and it can refer to many electronic and technological things. One of them is the term “smart car” which is continually being developed to make them eventually drive on their own, according to the given manual. Since we are into the business of autoradio that has lasted for more than 10 years, we are very interested to hear about all trends and innovations and implement them in our player top products. Motivated by the fact that education and technology are both growing and transforming fast, we are encouraging young people to maintain the course and catch up with the new trends. We are carrying that out through our annual scholarship which gives yearly prizes to the best student essay. This year, we are giving away $1000 for the scholarship winner. All students that are currently attending any educational institution and can provide proof of enrollment are eligible to apply for the scholarship. With the official proof, you are also required to submit a short biography with basic personal information and future goals. In order to apply for the scholarship for Smart Vehicle Scholarship 2017/2018 you have to write a 700-word essay on this topic: ʺFuture cars and how I see themʺ. As the topic says, use your imagination, but at the same time base it on facts that you can find on credible websites or articles. 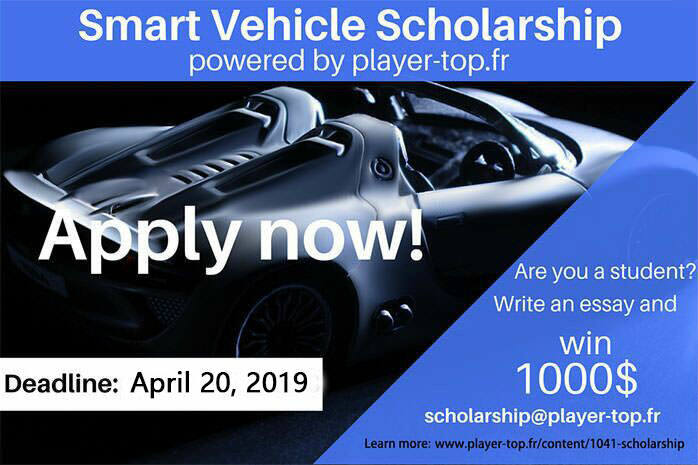 Please format the essay in Times New Roman, size 12 in word or PDF and send it to this email address: scholarship@player-top.fr. The application is free of charge. The deadline for the application is April 20th and the winner will be announced on April 25th. The main prize in the amount of $1000 will be mailed to the winner after the announcement. All essays we receive automatically have the permission of the owners to be published on our website. Private data that are submitted within the application are kept safe and not revealed to the third parties. Please follow our Facebook player top page to stay up-to-date.